Bi Luo Chun Hong Cha is made from Yunnan tea leaves (same tea leaves that are used to produce Yunnan Gold and Yunnan Pure Gold) and carefully rolled into the shape of spiral, very similar to Fujian Bi Luo Chun (Green tea). 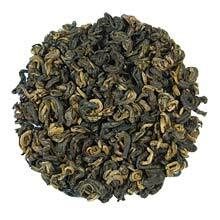 It is also the only Black tea that we know of where the tea leaves are tightly rolled. An excellent drink for the cold weather as this tea helps to keep your body warm and to quench your thirst. The infusion produces an amber-colored liquor that is as smooth as Aged Pu-erh tea and has a slight hint of malt flavor. It is made of black and gold leaves rolled in spiral shape (similar to Bi Luo Chun).